The statistics come from the Australian Competition and Consumer Commission's second quarterly report into broadband speeds which focused on the impact that underperforming service had on overall download speeds. The report tested services from six major telco providers: Telstra, Optus, TPG, iiNet, MyRepublic and Aussie Broadband. 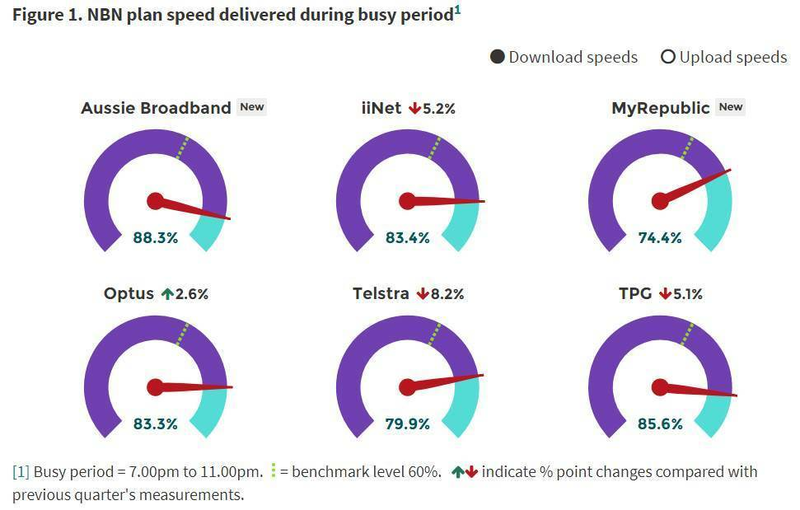 Despite the improvement compared to the previous report, there was a "significant disparity" between the top performer, Aussie Broadband, which achieved 88.3 percent of the maximum speed during busy hours (7 – 11PM), and MyRepublic, which reached 74.4 percent maximum speeds. "Whilst we are pleased to see that most customers are able to get fast, reliable broadband services even during busy hours, we must focus our attention on those who do not have this experience,”ACCC chairman Rod Sims said. The consumer watchdog said its report would hopefully prompt further performance-based competition among the telcos aiming to close the gap on download speeds. Optus was the only telco to show an improvement compared to the last quarter, increasing its download speeds by 2.6 percent to hit 83.3 percent of the maximum speed. The ACCC said this was a sign of the benefit of its Measuring Broadband Australia report last quarter, which suggested Optus was lagging behind its competitors. Telstra's speeds dropped 8.2 percent to 79.9 percent of maximum speeds, TPG fell 5.1 percent to reach 85.6 percent and iiNet slid 5.2 percent to hit 83.4 percent. Aussie Broadband and MyRepublic were both included in the report for the first time. Internet speeds have been on the rise in part thanks to NBN Co's mandate to encourage customers to take up internet plans with 50Mbps download speeds and higher. The company discounted wholesale prices in December and since then, the number of customers with 50Mbps plans or higher has increased to 44 percent as of June 2018. Five of the companies tested in the report, barring Aussie Broadband, have all been penalised throughout the year for making misleading claims about their NBN performance by providing services that can't reach the download speeds they advertise. Overall, the ACCC said there was a potential to increase download speeds by between 1.5 and 9.4 percent across the six telcos that were tested if underperforming ISPs could improve speeds. ACCC defined underperforming services as those where "no more than five percent of the speed tests that we conducted over the service achieved a speed that was above 75 percent of the maximum plan speed". ADSL services reached average download speeds of 6.7Mbps in the busy period in the same time. The ACCC tested download speeds on services on 25, 50 and 100Mbps plans, as well as ADSL services in May 2018, performing more than 145,000 download speed tests in that time.